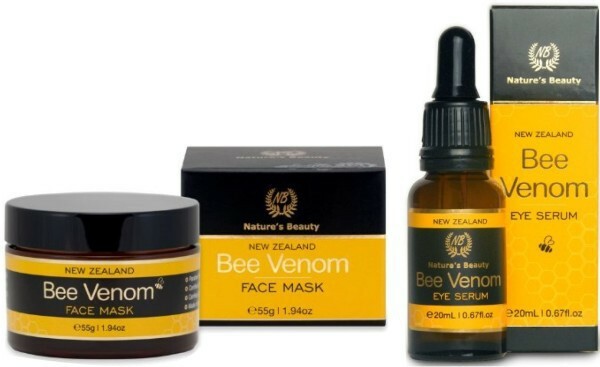 What is honey bee venom? A sting of a honey bee is not just a sting. Every time a honey bee stings it inserts a small quantity of poison into our body. A toxin, also known as venom. This venom is contained in a special venom sac, which can hold 0.15 to 0.3 mg of venom. Honey bees sting only when their hive is threatened, or they are annoyed by some odors or colors. When they sting, a mixture of alarm pheromones, from a gland near the sting chamber, is released. These pheromones will announce the other bees in the hive, which will open their mandibles, get out their stingers, and sting anything that moves. 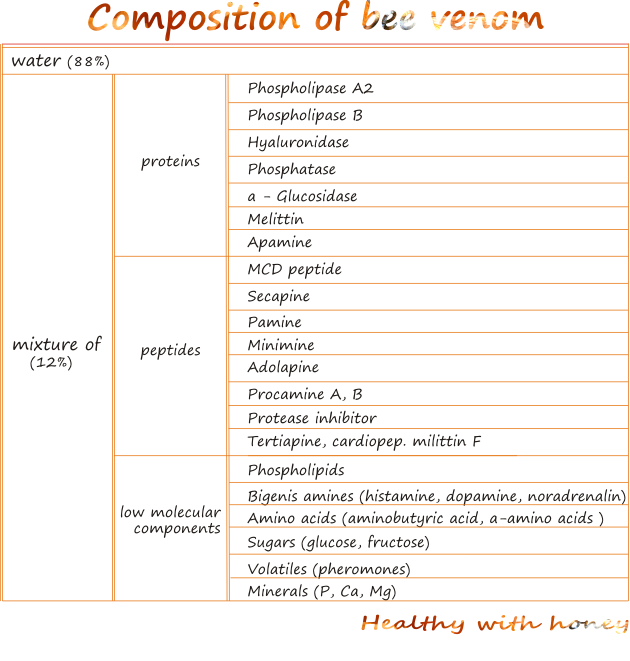 The quantity of venom a female honey bee carries is not the same. It increases in the first two weeks of the adult honey bee, and is at its maximum level when the bees had to defend the hive or go foraging. Once they get older, the venom quantity decreases. The queens also have stingers and their quantity of venom is higher when battles with other queens are inevitable. The drones (male honey bees) don’t have stinger and so no venom either. 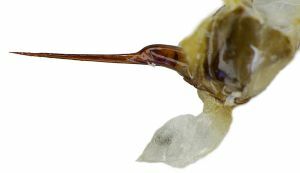 The stinger must be removed as quickly as possible because the nerves continue their activity and the harm increases. The venom is a clear liquid, odorless and watery. Dried venom is yellow and when found in drugs is brown, due to oxidation of some proteins. 88% is water. The rest is a complex mixture of proteins, peptides and low molecular components. There is a difference between fresh and dried venom because of its volatile components, but the overall biological activity is similar. People said “the bee is a disposable syringe with a unique drug”. This materialistic way of considering honey bees as mere instruments to our benefits, it’s crude and inhumane, yet true. Honey bees seem to have come to this world to offer us food and medicine, even gave their lives for this. –Diseases of the central and peripheral nervous system (multiple sclerosis, dementia, post stroke paralysis, polyneuritis, ganglion nerve inflammation, cerebellar ataxy, suringomyelia- pain of extremities, headache; inflammation of facial nerve; myopathy; trigeminal neuralgia; postrtraumatic inflammation of plexus nerve; Parkinson; Alzheimer; lower back pain. –other diseases: ophthalmology; gastroenterology: colitis, ulcers; pulmonology: asthma, bronchitis; pharingytis, tonsillitis, ear nerve neuritis; endocrinology; urology, gynecology, cancer, HIV. The therapeutic dose is much lower than the toxic one. Yet, only medical doctors should apply it, because of the dangers of allergy reactions. – Puncture with whole bees (a naturist approach)- in specific points or zones. – Iorish technique: bees are gradually applied on the outer surface of shoulders and tights. The number of bees increases to 10 bees to the 10th day, then it follows a break of 3-4 days. After the break the numbers of bees is decreased from 10 to 1 during another 10 days. – Kuzmina technique: bees are gradually applied increasing to 10 bees to the 10th day. Then a break of 3-4 day follows, and then the number of bees are increased by 3 in every session: 3, 6, 9 ….30. Children under 5 years old: must not undertake bee venom therapy. One sting should contain a maximum of 50 to 100 μg bee venom. The lethal dose is of 2.8 mg/kg body or 19 stings per kg. For example: a man of 75 kg will die after 1400 stings. Persons with bee venom allergy should not follow this treatment. An allergy test should be done first. It is also counter indicated in: acute and chronic infections, after vaccinations, chronic tuberculosis and hepatitis, acute cancer, children under 5 years old, pregnancy, breast feeding, type 1 pancreatic diabetes, renal insufficiency, hepatic failure, impaired cardiac functions and respiratory problems. After a person is stung, there are some symptoms arising in a few minutes: redness, swelling and itching. They can also be accompanied by: shivering, vomiting, nausea, shortage of breath. And remember not to panic too much: it takes 1400 stings to kill somebody. Check how to prevent or treat bee sting. – “Apis Melifera or the poison of the honey bee considered as a therapeutic agent” by C.W.Wolf, a famous homeopathic physician in Berlin, in 1858. – “Bee venom, a remedy” by Lokumski and Lubarski, in 1868. – “Report about a Peculiar Connection between the Bee Stings and Rheumatism” by Philip Terc, an Austrian physician, in 1888. – Bodog Beck published a book in US, on therapy against rheumatoid arthritis. And the list goes on. Apitherapy News reports that some celebrities like Kate Middleton, Victoria Beckham, Kylie Minogue and Bar Refaeli are helping propel the trend into the 21st century and Hollywood actress Gwyneth Paltrow, known for her love of unusual and holistic treatments, recently revealed she used bee venom therapy to treat the insect bite. Read the whole article here: What is the best cream for wrinkles? If you need to bee venom powder for your product i can give you best price 40$ 1 Gram nobody sells for that price in the world and highest quality Guarantee,.we have 96 company in 25 different country ,they reselling our product maybe you are buying from one of our reseller for double price. Auriez vous l’adresse d’un médecin pratiquant l’apithérapie, à me communiquer sachant que j’habite à Nice (France) ? Here is a list with apitherapy societies in France. I wish you find the best for you. Very informative. It is a amazing how we can get the medicine we need directly from nature. Nature is indeed our friend, we only tend to forget that.